Detractors call it an anachronism. Fans call it “real.” The Jeep Wrangler, updated and made user-friendlier in 2007, is something you either love or write off as pointless, depending on your outlook. Most enthusiasts expect 21st-century comforts and gadgets in their off-road vehicles, namely city cars that can be taken into the boondocks come the weekend. Jeep fans want a rugged, go-anywhere adventure vehicle that can be driven to work come Monday. Catch the shift in emphasis? Part of the Wrangler’s rugged appeal lies in something that has not changed since Jeep first entered history in 1941; you can drive it with the roof and doors off and the windscreen folded flat, should you ever feel so inclined. I wouldn’t, because I like doors to keep the lions out and don’t fancy bugs in my teeth, but it takes all kinds. Quite true, folks, Jeep Wrangler’s three-piece roof can be removed without too much pain and stored back home in your garage or left at the campsite. If it rains, a folding roof can be pulled into service. The doors are removed quite easily with basic tools and the windscreen can be folded down onto the bonnet. Wiring for power windows and such is disconnected by means of simple plugs. My personal observation on the roof business is that you might do better to stash the soft roof in the garage and never use it again. Some overseas buyers have complained of unfixable leaks and when it’s folded, it severely hinders access to the boot area (my observation). Like the original warhorse, plain Wranglers have a short body and two doors. This is OK for weekend adventuring while the kids are young, but when they grow into their ‘teens, you really need more space and two more portals. Enter the Unlimited. What this grandiose title means is an extra 520 mm between the axles, a rear seat that actually accommodates three people and a means of getting into it without scrambling. Like any longer wheelbase alternative, you gain a more comfortable ride, but trade off some manoeuvrability. 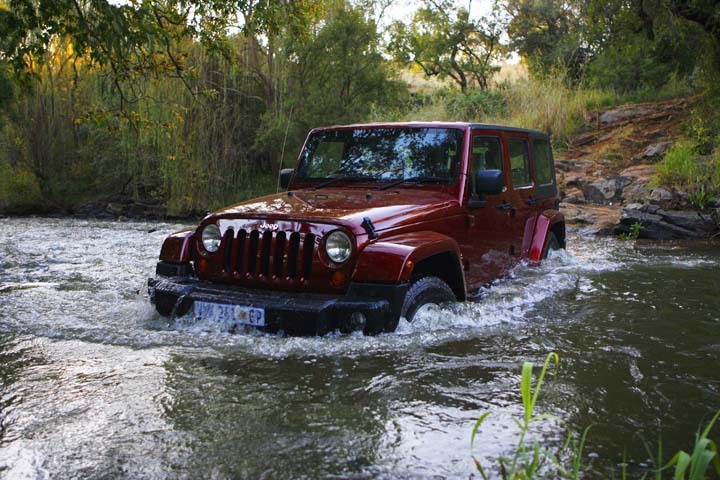 In the case of the Wrangler, your lose five degrees of ramp-over angle and have to approach some sharper turns in instalments, but that’s life. All this by no means implies that the Wrangler is all WWll; it comes with a choice of very decent 2,2-litre commonrail diesel or 3,8-litre petrol engines, has slightly firm but pliable suspension that irons out most bumps, boasts most mod cons like air conditioning and power windows, offers a choice of good basic sound system or an upmarket MyGig unit with extra capabilities and satnav, and shifts gears with a competent if slightly old fashioned five-speed automatic gearbox. 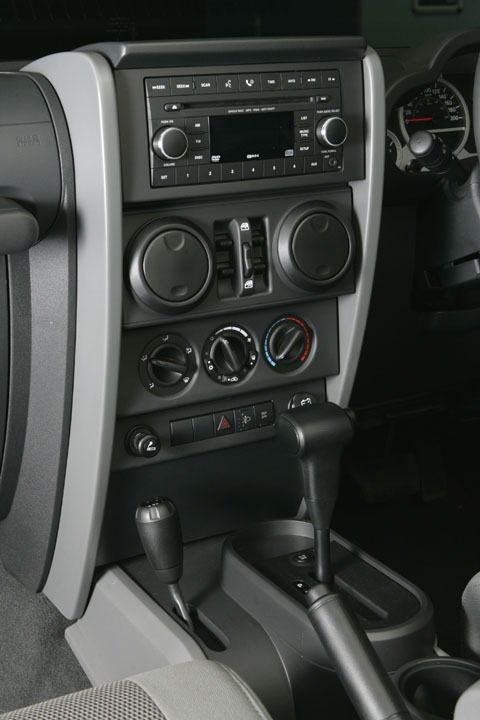 Selection of 2H, 4H or 4L is by means of a separate lever next to the main gear stick. It also has two airbags, ABS with on- and off-road calibration and Brake Assist, ESP and Roll Mitigation. This selectively reduces torque and applies braking force to individual wheels when enthusiasm exceeds common sense and things start getting top-heavy. On first getting into the Wrangler I moved the (height-adjustable) seat to a comfortable position in relation to the brake pedal, but had to move it slightly further forward again when I found it difficult to reach the accelerator. This resulted in a somewhat odd driving position, but one quickly adjusts. You end up sitting sort of like a bus driver, but it suits the utilitarian nature of the vehicle, reminding you that this is no citified toy but a real working machine. Front chairs are comfortable enough and reach to controls, even the oddly placed lock slides, aircon buttons and window switches, is easy once you figure them out. Rear seating is rather more utilitarian than this scribe is used to, but it gets the job done. I found the squab a bit short beneath the thighs and the 60/40 split backrests could use a few more degrees of recline. On the road, the diesel version cruises at 2 000 rpm at 120 km/h in top gear, with just enough engine noise to remind you that things are working, and wind noise is by no means as intrusive as on a certain competitor. Conversation can be maintained and the sound system used without turning the volume up to distortion levels. Top speed is a claimed 180 km/h and the benchmark 100 km/h is reached in about 11,7 seconds. 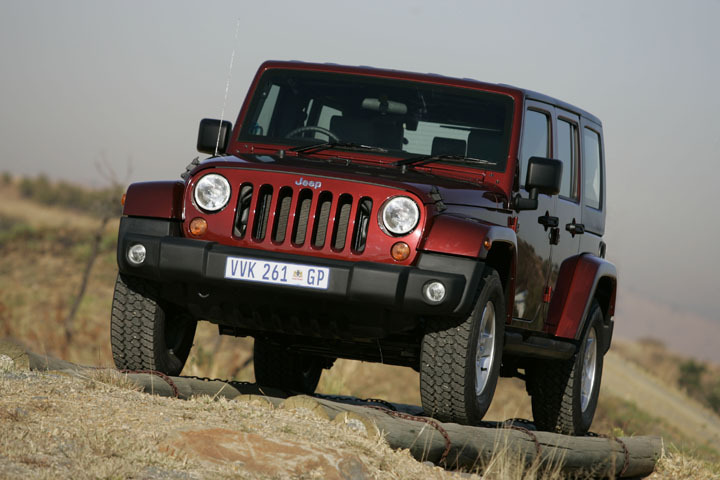 While they may look like throwbacks to the past, Jeep’s Wrangler models account for 59 percent of the brand’s worldwide sales and have just broken two new records in SA – 100 units in February and 125 in March. Perhaps “keeping it real” is what it’s all about?